San Diego Gas & Electric has been delivering San Diegans their power for almost 150 years. 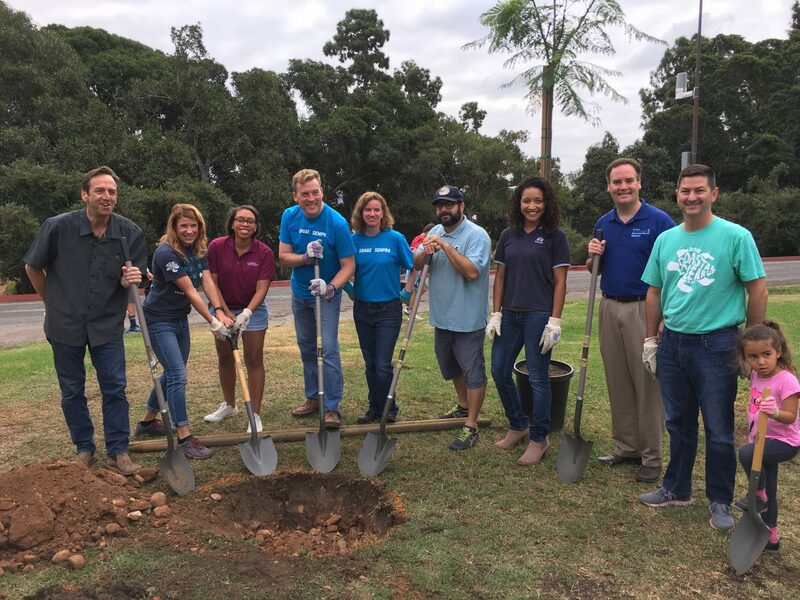 On top of their work providing around 45% clean energy to homes and businesses in this region – compared to an average of 8% nationwide – SDG&E supports many local nonprofits organizations that are working to improve the environment. 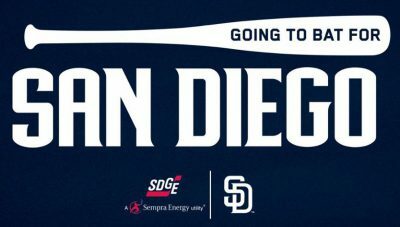 This year, SDG&E and the San Diego Padres are Going to Bat for San Diego, and teaming up to support I Love A Clean San Diego and celebrate Coastal Cleanup Day. ILACSD is proud to be part of the 2018 Going to Bat for San Diego Starting Lineup! As a special thank you to volunteers that Go to Bat for San Diego, SDG&E and the Padres are recognizing Coastal Cleanup Day participants with a Volunteer Appreciation Night at the Padres game on Monday, September 17. Coastal Cleanup Day volunteers receive a promo code to purchase discounted tickets and be recognized for their accomplishments in keeping San Diego clean. The 34th annual Coastal Cleanup Day will bring thousands of volunteers together on September 15th to beautify more than 100 beaches, parks, and other outdoor spaces throughout the region. 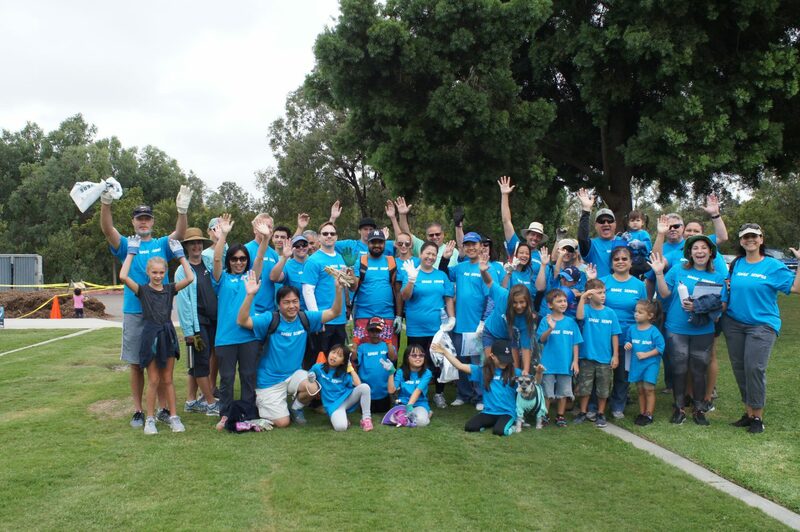 Over the past 17 years, SDG&E has helped support I Love A Clean San Diego’s Coastal Cleanup Day efforts with the participation of thousands of employee volunteers! We are pleased to highlight two SDG&E heavy hitters who have stepped up to the plate to serve as site captains for Coastal Cleanup Day throughout the years. 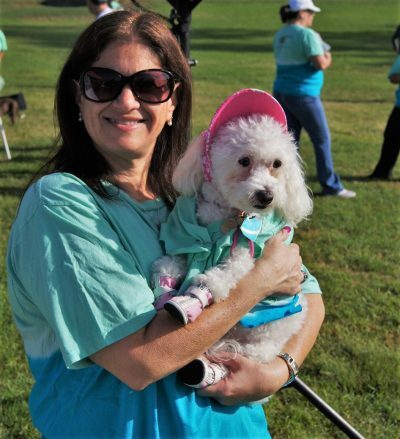 Crystal and her sidekick, Tipsie, at Coastal Cleanup Day 2013. Crystal has been an SDG&E employee for 15 years and a Coastal Cleanup Day site captain for close to 10 years. 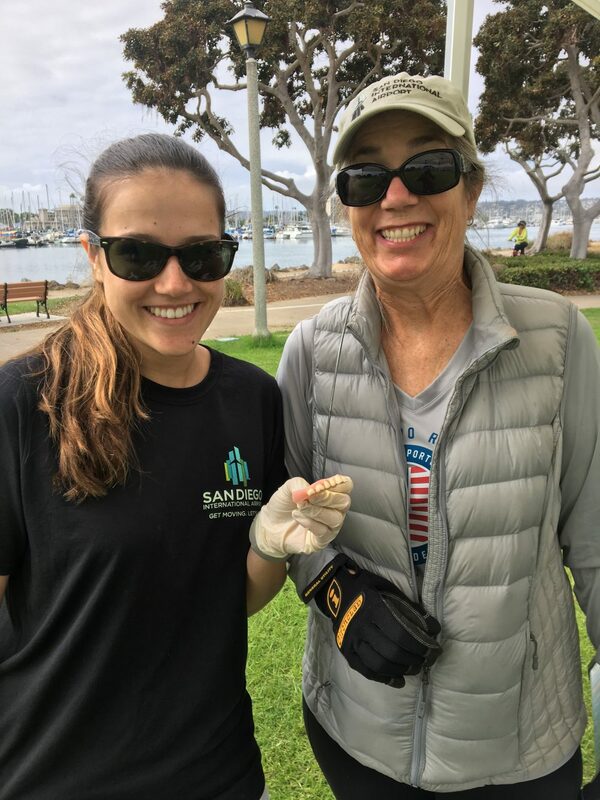 She can always be counted on to go wherever there is a need, and Coastal Cleanup Day has led her on expeditions to Encanto, Poway, Golden Hill, and Rancho Bernardo, among other places. In her day job, Crystal works at SDG&E’s Environmental Lab, which does environmental sampling and test analyses. The Lab is certified to test for more than 500 chemical compounds, ensuring that SDG&E facilities are operating safely. In Crystal’s decade of service at Coastal Cleanup Day, she says her favorite part of the annual volunteer event is seeing kids’ enthusiasm when they find a strange piece of trash. Whether it’s a shoe, a stuffed animal, or even a bathroom scale, kids often burst with excitement recounting where and how they found it, and in some instances, even make up stories for what they think the item is. It’s like trash show-and-tell. 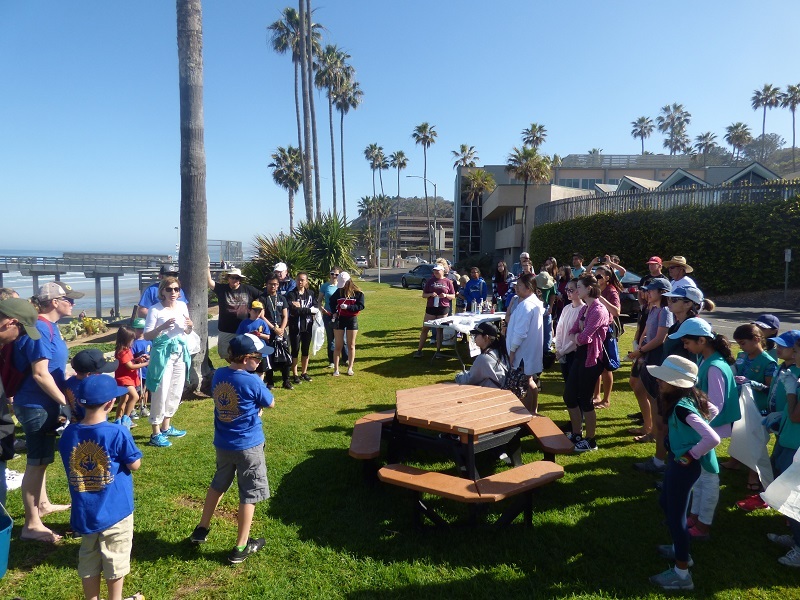 Crystal also notes that she feels a sense of pride each year when she arrives at Coastal Cleanup Day to a sea of Team SDG&E volunteers outfitted in team t-shirts, which for many years were the two-toned tie-dye in the photo to the left. SDG&E and I Love A Clean San Diego are lucky to have folks like Crystal committed to ensuring a safe and successful cleanup for volunteers of all ages! This year, you can find Crystal helping out at the South Shores cleanup site in Mission Bay with Team SDG&E. 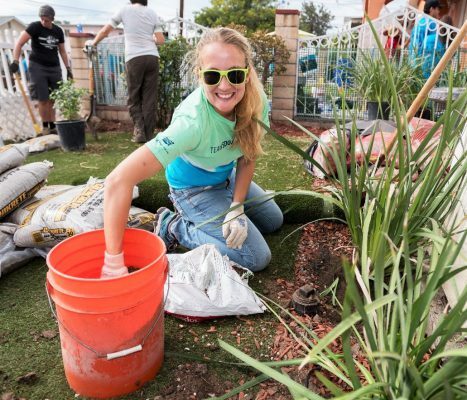 Hilary participating in the 2016 City Heights Facelift with Team SDG&E. Hilary has been an environmental enthusiast from a young age. In fact, in high school she conducted regular beach cleanups, and in college she interned with another environmental nonprofit, Orange County Coastkeeper. Fun fact: during Hilary’s internship, she helped to plan Kids’ Ocean Day in Orange County, aerial art and all! That’s the sister event to ILACSD’s San Diego Kids’ Ocean Day that occurs every spring. Hilary joined SDG&E a little over two years ago and jumped right in with Coastal Cleanup Day. Last year, she led the San Dieguito Lagoon site for SDG&E, and this year you’ll find her at the Paradise Creek site in National City. Aside from having a good attitude and strong leadership qualities, Hilary brings another attribute to her role as site captain…she knows a lot about the environment! At SDG&E, she makes sure projects like the placing of a new power pole, or even the removal of one, don’t result in a detrimental environmental impact. She’s also one of the company’s leading sustainability advisors, helping to track SDG&E’s environmental performance in key areas. 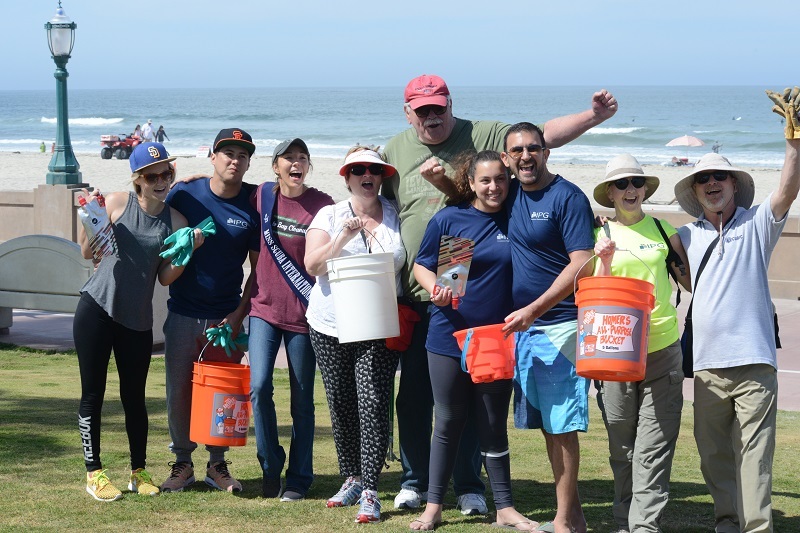 While Hilary hasn’t been a part of Team SDG&E for very long, we anticipate that her involvement in Coastal Cleanup Day will continue for many years to come! ILACSD is grateful for SDG&E’s longtime partnership and the hands-on role team members take on to make sure we knock Coastal Cleanup Day out of the park! 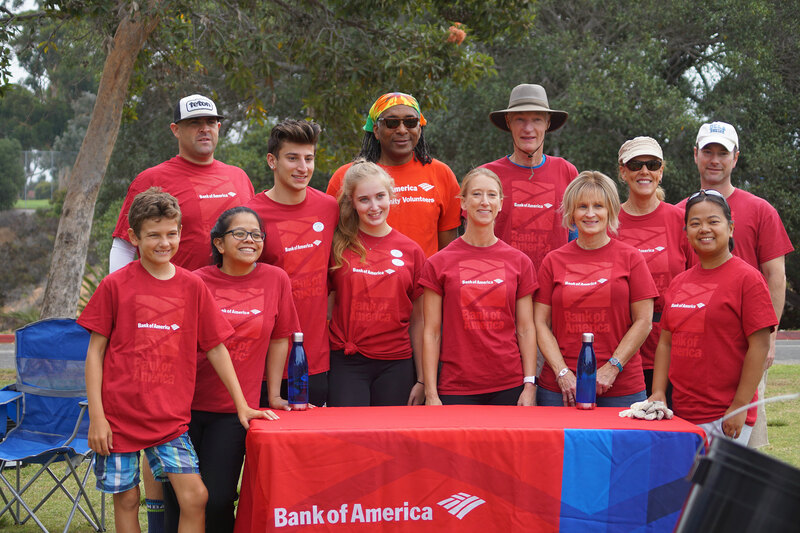 This past weekend, we celebrated Earth Day by hosting our 16th Annual Creek to Bay Cleanup where we empowered an estimated 6,000 volunteers to give back at 113 cleanup sites around San Diego County! 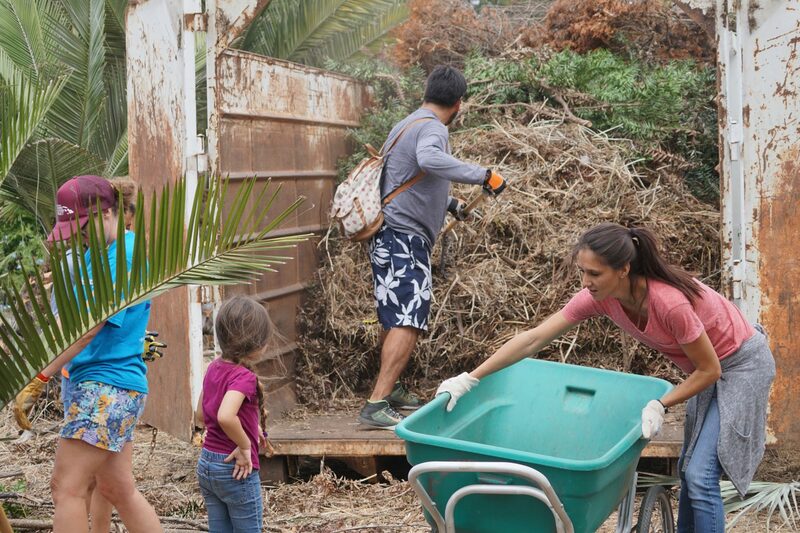 Volunteers including residents, corporate groups, and civic organizations transformed their appreciation for San Diego’s environment into action for Mother Earth by putting in the time and effort to give back in their local communities. During this three-hour cleanup, volunteers enhanced the overall health and beauty of San Diego’s natural environment by removing more than 175,000 pounds of trash and debris from San Diego County. Volunteers joined site captain, Brittany Novick (Miss Scuba International), to help celebrate her birthday and Earth Day by protecting the environment at the Mission Beach Belmont Park cleanup site! 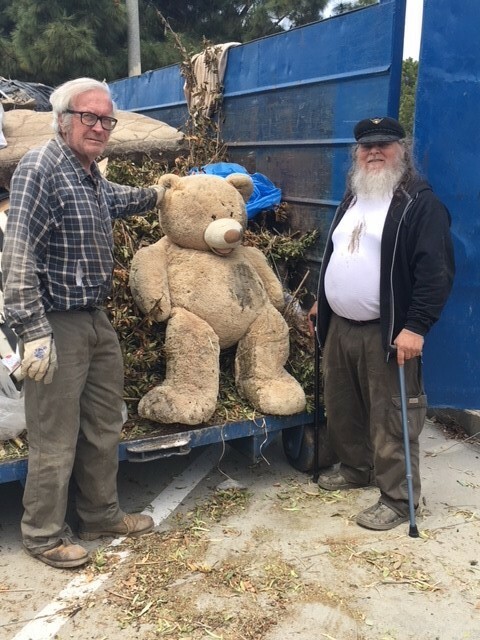 Among the debris, there were several notable odd items collected during the cleanup including: 19 shoes at one site, a giant teddy bear, and a bathrobe. Volunteers also restored the local environment through beautification projects such as painting park structures, planting native plants and trees, mulching, and weeding. Thanks to thousands of volunteers, 113 parks, beaches and community spaces received special care to keep the area healthy and beautiful for the community. Painting was just one of many beautification projects that volunteers could take part in on top of litter removal at Creek to Bay! Creek to Bay was an opportunity for the community to go green in more ways than one. With a push toward zero waste practices, we encouraged all youth and adult volunteers to be more sustainable by choosing to bring at least one reusable item for the cleanup like a water bottle, work bucket, or gloves. Many stepped up to the challenge! Volunteers could showcase their zero waste commitments in the Sony Photo Contest with the 2018 theme of “Rocking Reusables” or by entering the Bling Your Bucket Contest. Both contests offer prizes to the winners to celebrate their sustainability and creativity. 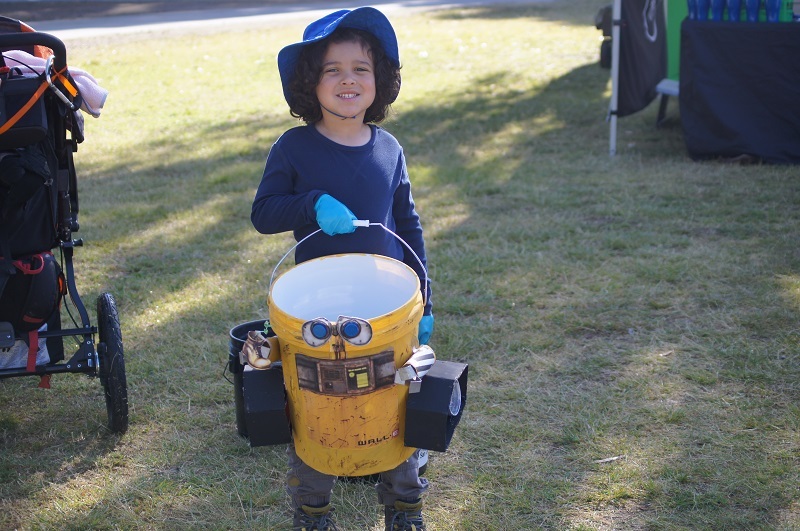 Gabriel used recycled items to decorate his bucket for the Bling Your Bucket Contest helping cut back on the waste created at the cleanup! Councilmember Bry helps kick off the Creek to Bay at the Scripps Pier site! This was my first year planning Creek to Bay, and after months of preparing it was amazing to be a part of the event! From recruiting volunteers to organizing activities, I was excited to see so many neighborhood volunteers come out and beautify Azalea Park and all of San Diego County! This was such an undertaking, and it was incredible to watch all of our work pay off for a cleaner environment. Major thanks go out to all of our sponsors for the Creek to Bay Cleanup! Creek to Bay would not be possible without the generous support of our sponsors and partners! Thank you all for your commitment to a clean, green, and beautiful San Diego! 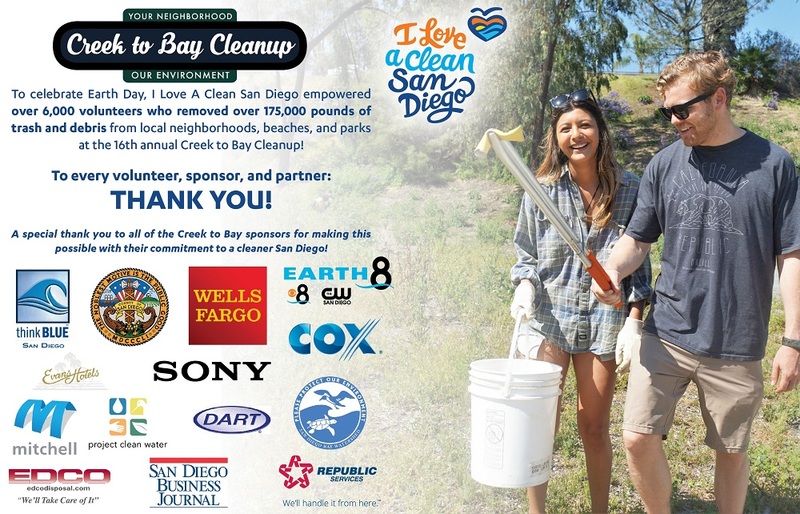 Thank you to all of our Creek to Bay sponsors for investing in a cleaner San Diego! From the entire ILACSD team, THANK YOU to every volunteer, partner, sponsor, and community member who made Creek to Bay such an incredible success! We couldn’t do it without you! 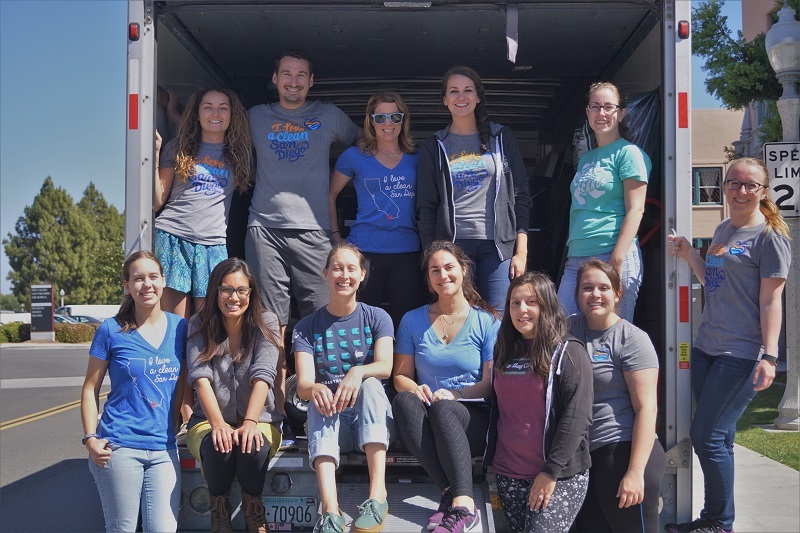 While results continue to trickle in from this year’s Coastal Cleanup Day, one result we can’t overlook is the incredible time that was had by all of our participants! 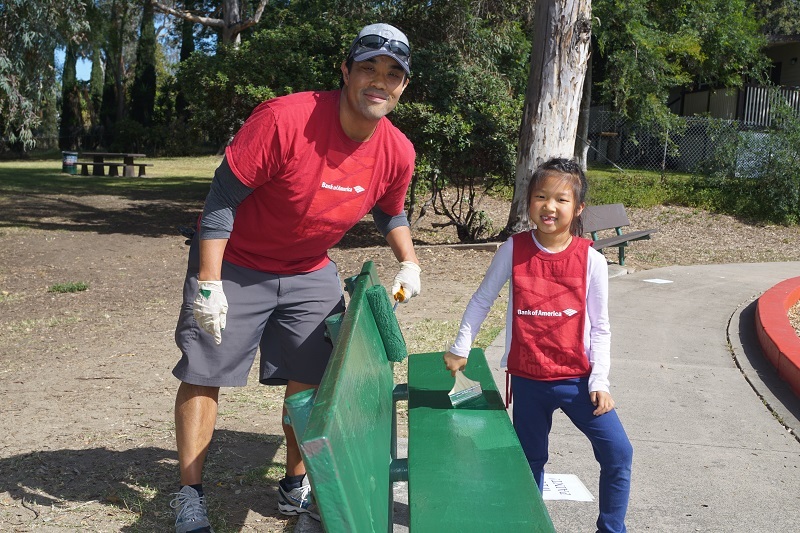 From volunteers picking up litter at the beaches to groups removing graffiti and refurbishing playground equipment, the volunteers expressed the immense joy they took away from the experience! As a direct result of all of that hard work, San Diegans are now able to enjoy more than 100 clean outdoor spaces free of litter! ILACSD’s Pauline with our sponsors and speakers officially kicking off Coastal Cleanup Day by planting a tree. For the past 30 years, I Love A Clean San Diego has coordinated Coastal Cleanup Day in San Diego County as part of a statewide and international cleanup effort to restore coastlines across the globe. The effort is coordinated statewide by the California Coastal Commission and internationally by The Ocean Conservancy. While international totals for 2017 are not available yet, in 2016, in 92 countries around the world 504,583 volunteers picked up more than 18 million pounds of trash! A before and after look at the D Street Fill cleanup site in National City! ILACSD team members woke up extra early on Saturday morning to lead more than 250 volunteers in beautification projects at Golden Hill Park. Even with volunteers spread out among various beautification projects including mulching, tree planting, mural paints, and storm drain stenciling, they still managed to clear out over 2,500 pounds of debris! 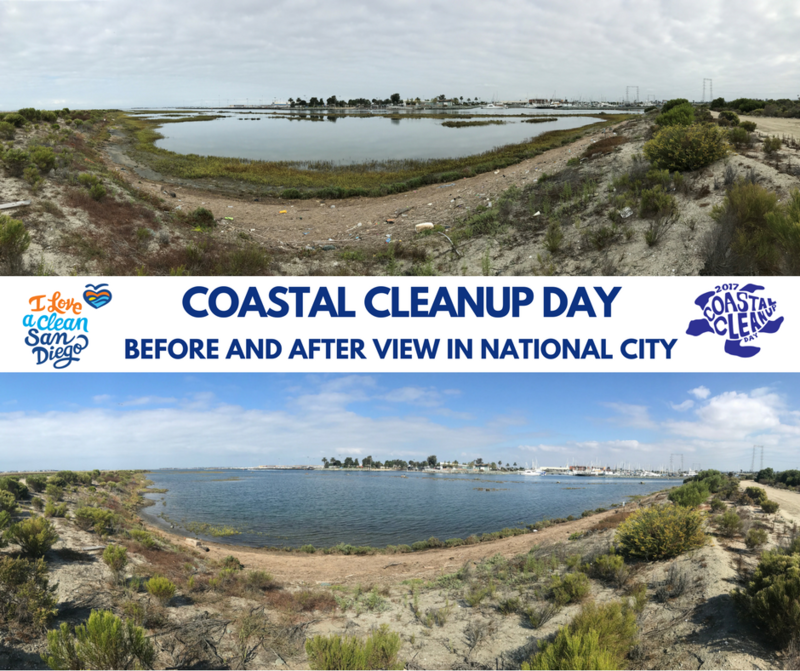 As for the entire county, preliminary totals for Coastal Cleanup Day in San Diego indicate that we had over 7,500 volunteers cleaning up 105 local creeks, canyons, beaches, and bays as part of this event! While the trash totals are still being compiled, we are expecting that more than 150,000 pounds of trash were removed from San Diego County. On top of the trash removal, volunteers also beautified and enhanced the local environment through painting murals, removing invasive plants, planting trees, mulching, and performing a variety of park maintenance projects. 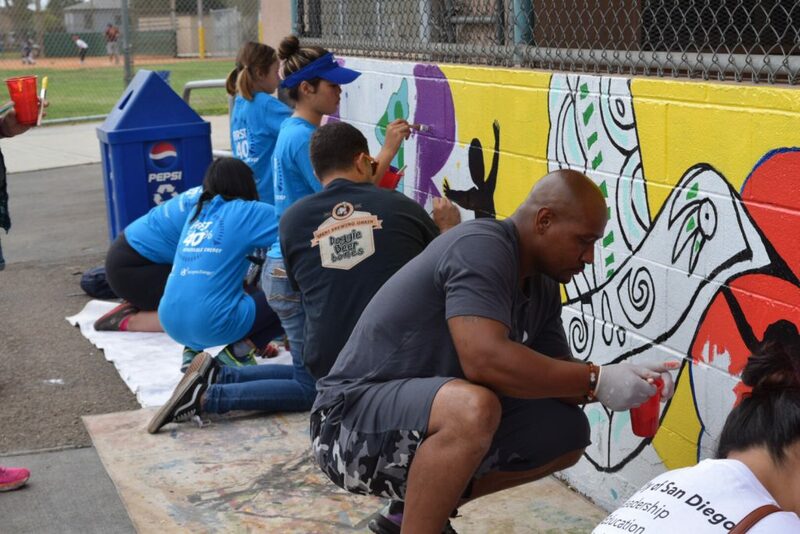 Volunteers painted a mural at the Golden Hill Recreation Center! Volunteers preparing an area to be mulched. Every year at Coastal Cleanup Day and Creek to Bay, our two annual countywide cleanups, we see that cigarette butts and small plastic items are our most commonly found items. While unfortunately, this information is not that surprising, we are often stunned by some of the unique pieces of litter that our volunteers find. Some of the favorites this year include a dish rack, costume vampire teeth, RV door, an elephant shrine, and a Charger’s jersey. Volunteers at Spanish Landing found dentures during their cleanup. Many thanks go out to all that donated their time and effort to volunteer with us on Coastal Cleanup Day. We feel lucky to put on such a beloved event with dedicated and wonderful participants every year! This year, we had individuals, groups, and corporate volunteer teams out all over the county representing various organizations including SDG&E, Wells Fargo, Lincoln Military Housing, Bank of America, San Diego County Water Authority, San Diego Metropolitan Credit Union, Illumina, Evans Hotels, and a large number of scout troops! Bank of America volunteers winding down after cleaning up the Golden Hill site! Volunteers from SDG&E excited to clean up at the Scripps Ranch site. See more pictures from Coastal Cleanup Day and our other cleanups on Facebook and Instagram! Looking to join us at our next event? We have a quite a few volunteer opportunities coming up. Visit our upcoming events page for more information on how to get involved!